Emissions Testing. An achilles heel for any performance car. Power robbing, air restricting, weight additive emissions components are all detrimental to performance. And the RX7 has plenty. With the introduction of more common place OBDII managed cars the old emissions testing stations are dying out. Some areas of the country no longer mandate periodic emissions testing. Those lucky enough to live in those areas simply remove all the emissions related equipment. I don't but that doesn't matter with respect to the Tweak-It kit. 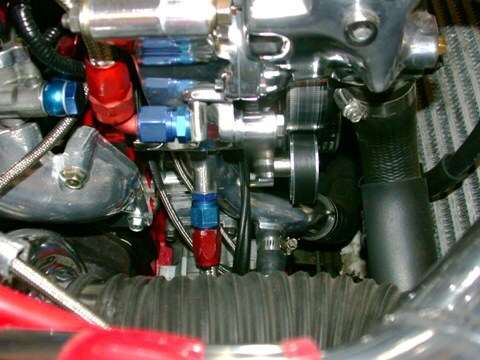 My car is set up to run the stock airpump, ACV, and all associated plumbing and can pass the MD emissions testing requirements with no trouble, even with the single turbo installed and with a ported motor. However, I've long desired to remove the airpump. Why? It's heavy, unsightly, acts to retain underhood heat, and does have some parasitic drag associated with the clutch mechanism. And it is easy to remove and reinstall. So why not remove it. The issue is with the water pump pulley. When the airpump is removed the belt contact area on the water pump pulley shrinks considerably. 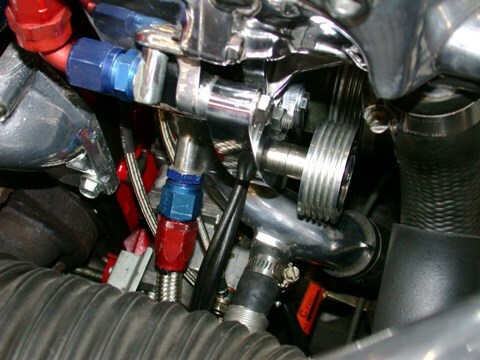 It's small enough that under load and at high RPMs the belt will slip on the water pump pulley and which may result in cooling issue. This problem is further compounded when an underdrive eccentric shaft pulley is installed. So what most people do is apply extreme tension to the belt. this is bad. Bad for eccentric shaft bearings, bad for alternator bearings, bad for water pump bearings...just plain bad. The belt really needs to be wrapped around a larger surface are of the water pump pulley as it was originally intended such that the belt doesn't have to be tensioned to the extreme. 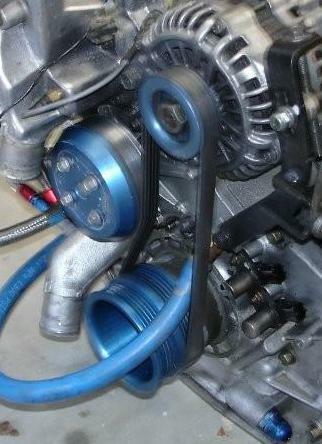 Enter the Tweak-It pulley kit. 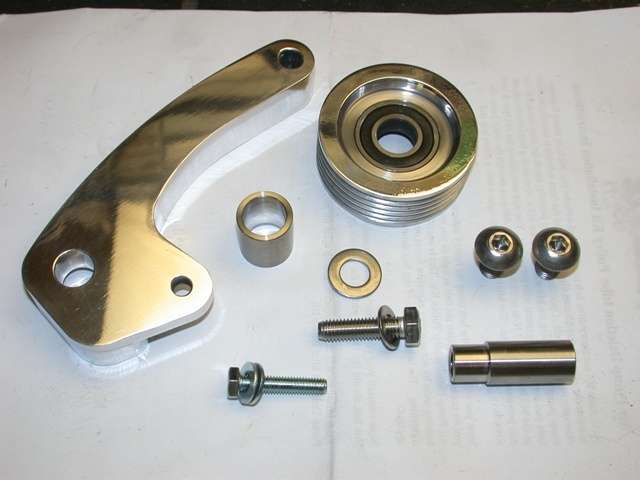 A nice solid chunk of machined billet aluminum, stainless hard ware and, good pulley. Of note is that Tweak-It voluntarily recalled the pulleys to install upgraded pulley bearinsg after a few premature failures were noted. The cause of the failures was not determined but Tweak-It Racing to their credit upgraded the bearing free of charge. Well done Tweak-It! Installation was a piece of cake. Very simple and the installation instruction provided were outstanding. In my case I removed the airpump, and hard piping to the ACV. I also taped up the electrical connector so I can simply reinstall the pump when emissions testing time comes due. 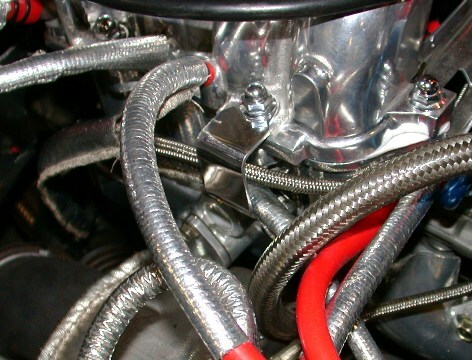 I did find a problem in that when the air pump and ACV pipes were removed the braided SS wastegate lines fell against the downpipe. Nothing that a small custom made polished aluminum bracket wouldn't cure! The old airpump installed (yes it was polished!). A test fit of the idler pulley. 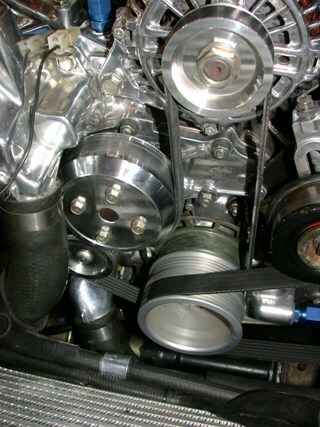 Note the very small belt contact when removing the airpump and a set of underdrive pulleys. 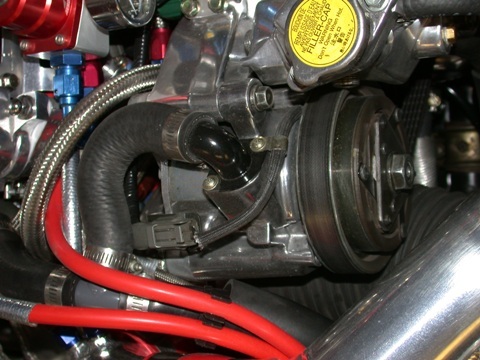 Compare to the belt contact area using the idler pulley. The final install with belt installed. A nice little polished aluminum bracket to hold the SS wastegate lines away from the downpipe. 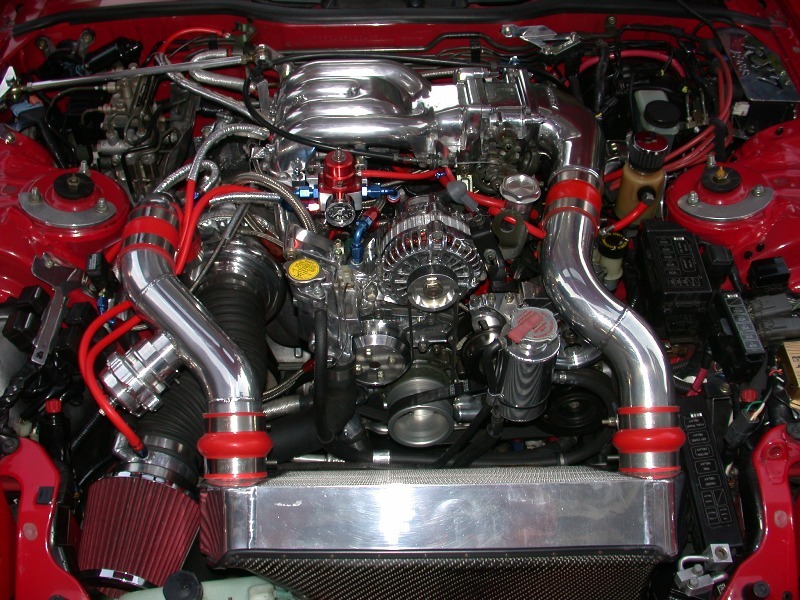 And yes there is a turbo under there. Now that the airpump is gone you can actually see it!